The US remains the world’s leading destination with a record-high 1.08 million foreign students enrolled in 2016/17. This represents a 3.4% increase over the year before (or the equivalent of roughly 35,000 additional students), and marks the 11th consecutive year of foreign enrolment growth in the United States. This continued growth, and the overall scale of foreign enrolment, is unquestionably impressive. However, the Open Doors 2017 data from the Institute of International Education (IIE) – released earlier today in Washington, DC – offers some important findings behind those top-line values. Indeed, the underlying trends this year are likely to have a significant impact on the context for international recruitment in the US going forward. IIE President and CEO Allan Goodman, centre, with colleagues from the IIE and officials from the US Department of State at the 13 November 2017 press briefing for Open Doors 2017, National Press Club, Washington DC. 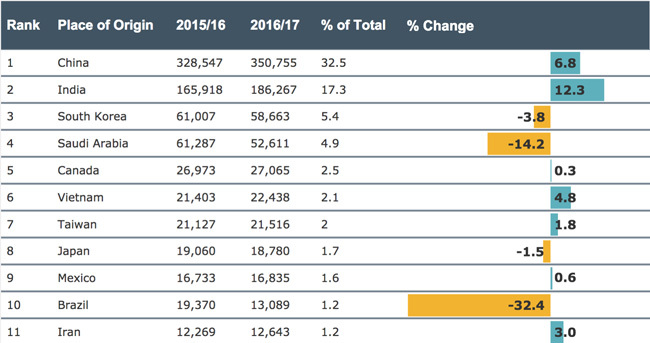 First, the number of first-time international students actually fell by 3% in 2016/17 (this amounts to a decline of roughly 10,000 student commencements compared to the year before). This is the first time that new student numbers have declined in the 12 years that IIE has been tracking this important metric. There have been other indications this year that growth has slowed in terms of international commencements in US graduate schools. The Open Doors data notes this as well (reporting a -1.3% decline in graduate commencements for 2016/17). But it also indicates a nearly 3% drop in first-time undergraduate numbers and, a roughly 9% decline in non-degree commencements – a category that includes intensive English language study. Second, nearly all of the growth in overall enrolment for 2016/17 has come from increased participation in the Optional Practical Training (OPT) programme. OPT allows international students to stay and work in America for up to 12 months following graduation. The programme was expanded under the Obama administration so that, as of May 2016, foreign graduates in STEM fields (science, technology, engineering, and math) could remain in the US for up to 36 months. This has contributed to a nearly 20% increase in OPT numbers for 2016/17, and, as OPT participants continue to be counted as international students in the US, those numbers also account for just over 80% of all foreign enrolment growth in the country for 2016/17. Absent those OPT counts, however, the total number of international students enrolled with US institutions grew by only .76% year-over-year (from 896,341 students in 2015/16 to 903,127 in 2016/17). It remains to be seen whether this is a one-year dip or the start of a longer-term trend. Even so, there is mounting evidence that international enrolment growth in the US has begun to flatten out. We see some further indicators of this in the early reports of 2017 enrolment trends, but also in the slowing or declining enrolment in key “feeder” categories in the US, including language programmes and secondary schools, both of which are important contributors to downstream post-secondary enrolment. Many observers will be quick to lay this decline at the feet of current US policy. The political context in the country has eroded its attractiveness in some quarters, as has the administration’s efforts to ban travel to the US by citizens of several Muslim-majority countries. However, the numbers we see for 2016/17 were largely determined before the November 2016 presidential elections in the US, and so cannot be easily attributed to current US policy or rhetoric. That said, today’s Open Doors release was accompanied by a second “snapshot survey” of 500 US institutions conducted by IIE in partnership with nine other education bodies in the US. This second survey again finds that overall international enrolment in the country is flattening, with respondents reporting an average decrease of 7% in the number of international commencements for fall 2017. As in earlier attempts to measure international enrolment and admissions yield in US institutions this year, the results of the snapshot survey were mixed. Nearly half of reporting campuses (45%) indicated they were seeing a decline in new foreign enrolments for fall 2017. However, almost a third (31%) reported an increase in commencements and 24% reported no change from fall 2016. Any significant or sustained decline in international enrolment could have far-reaching implications for US institutions, particularly those that are feeling the pressure of domestic demographic trends and declining public funding and/or that have come to rely more on international tuition revenues. As the following table reflects, the major sending markets for US institutions remain more or less stable for 2016/17. China and India continue to account for half of foreign enrolment, but India again outpaced China this year – and for the third year in a row – in terms of year-over-year enrolment growth in the US. South Korea, while still a top three sending market, continued to fall off in 2016/17. But the notable declining markets for the year were Brazil and Saudi Arabia. As we alluded to earlier, both saw significant drops over the year as the major scholarship programmes that had been in place in each market continued to wind down. The US Department of Commerce estimates that international students spent US$39 billion in the US in 2016 on tuition, room and board, and other living expenses. This represents a major increase over the previous estimate of US$35 billion for the year before, but is also largely in line with the overall enrolment growth in the US between 2015 and 2016. This entry was posted in Higher Education, Language Learning, Most Popular, North America, Regions, Research, United States and tagged education abroad, student mobility, USA colleges, study in USA, colleges with international students.